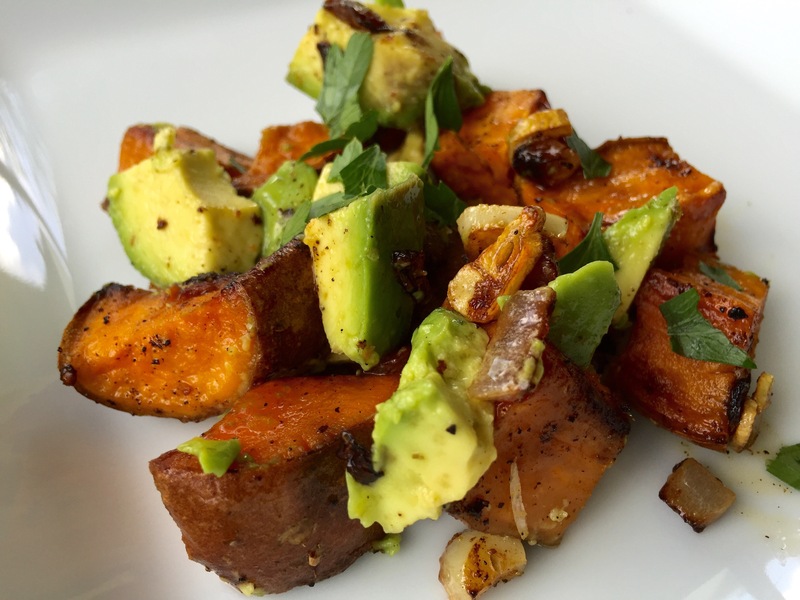 Meet my new addiction: Warm and crispy sweet potatoes tossed with cool and creamy avocado. I could eat this for breakfast, lunch, dinner, snack, or dessert! Heat oil in a skillet over medium high heat. Add in onion and garlic. Cut sweet potato into bite-sized pieces and place them into the skillet. Fry for about 5-7 minutes, flipping potatoes a couple of times. Cook until potato is browned and slightly crispy. 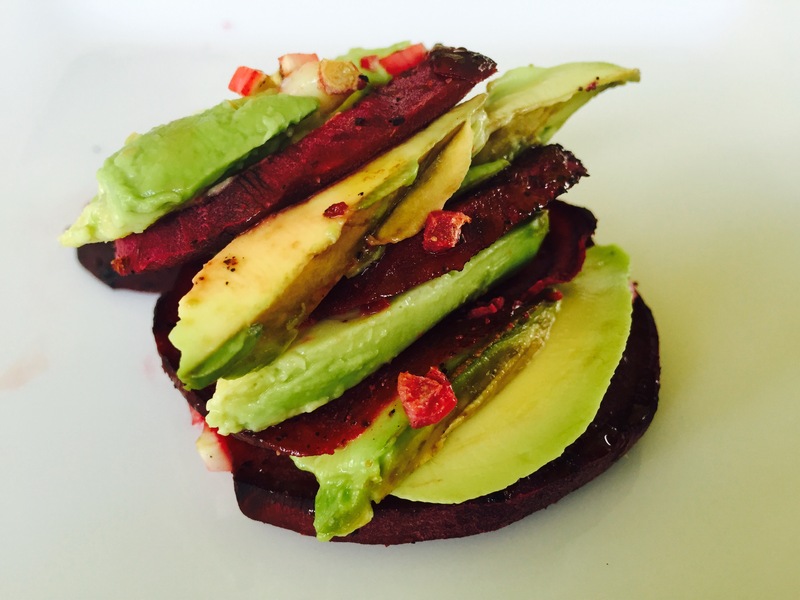 Immediately add into chopped avocado and gently fold together. Garnish with parsley. One week from today, we will be celebrating Cinco de Mayo! They say you eat with your eyes first. 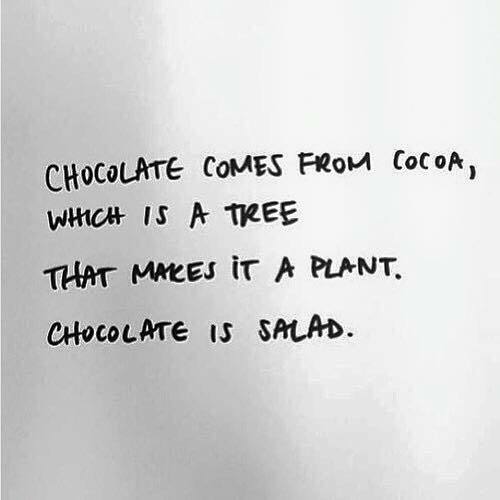 Perhaps that’s why cobb salads are so delicious and popular. The rows of color and texture are definitely appealing to the eyes. 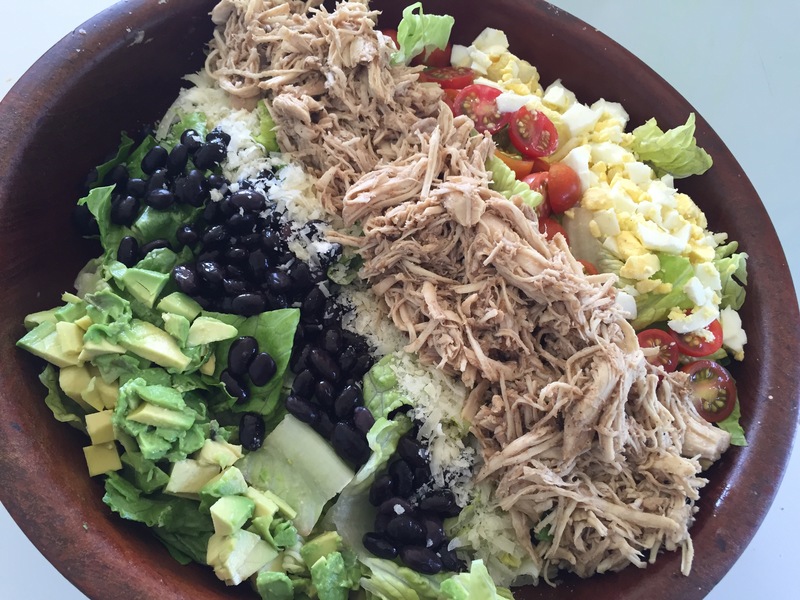 And since Mexican food is always bursting with color, why not recreate the cobb salad and give it a fiesta flare?! I got rave reviews from the husband, the husband’s friend, and all three kids on this one. Place the cooked, shredded chicken into a sauce pan and add the water and Mexican seasoning. Simmer on low for 5 min. Place washed and chopped romaine into a large serving bowl. Arrange the toppings in rows to create a varying array of colors. Serve with lime vinaigrette on the side. I am going on a field trip tomorrow with my oldest. I always like to pack a salad for my lunch, but a dressed salad can be tricky to take for a “brown bag” lunch. My solution is to use a hearty green, like kale, so it doesn’t get soggy and wilt. It makes the not-so-tender leaves softer and full of flavor. Well, I made it! 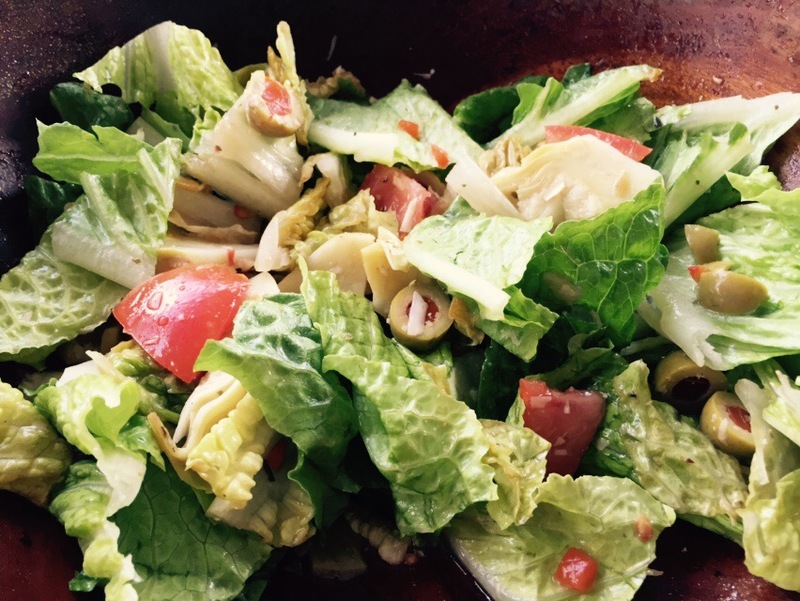 52 salad recipes – one for each week of the year! It took me longer than a year, but I am a wife of a full-time minister and student, the mom to three active kids, an avid exerciser, and a cooking addict. My time is stretched between so many different activities. While I would love to post all that I do and create, it’s just not possible. But I am thankful for what I do find time to share. I think I saved the best salad for last. This for sure is one of my all-time favorites! Place all ingredients into a food processor and process until smooth. Begin to process again and slowly pour in the olive oil. 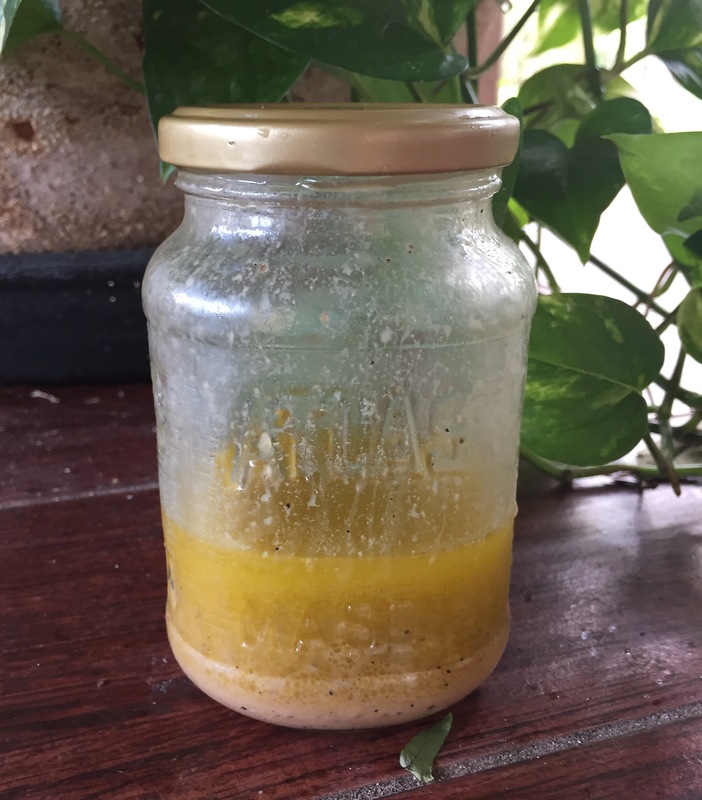 Store in an airtight, glass container in the fridge for 1 week. Last week on my FB page (which you can click here and ‘like’ my page for quick tips and motivation), I posted the above image. I was challenged to make a chocolate salad, therefore, after some trial and error and some research, I managed to do just that. Enjoy! I served this last night at our family’s New Year’s Day dinner. 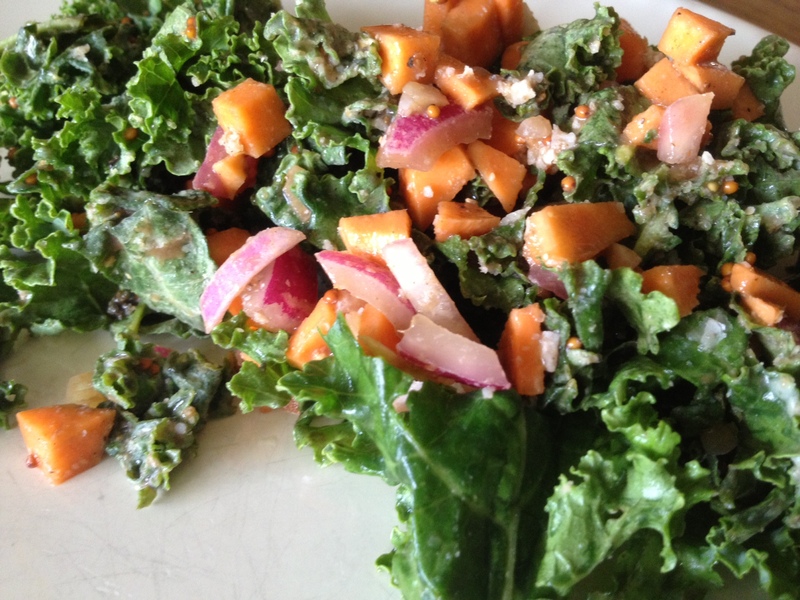 I love Giada’s orange vinaigrette dressing, and I knew it would pair perfectly with the sweet potatoes and cranberries. 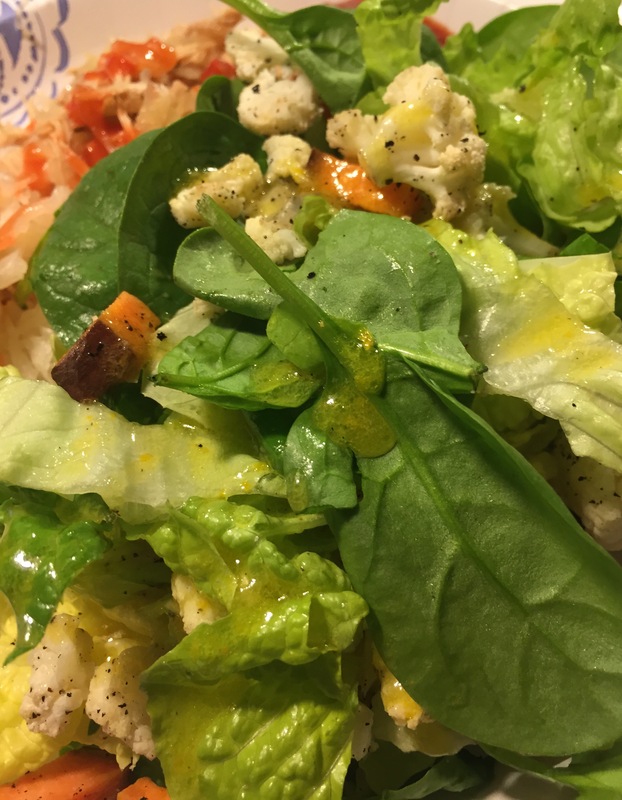 The dressing has more acidic flavor than oil flavor which I prefer. You can toss in nuts and/or seeds of your choice for a well-balanced combo of carbs, fats, and proteins. Salmon would also be an ideal topper for the flavors in this salad. Place cauliflower, sweet potato, onion, and garlic on a baking sheet. Spray with olive oil and season with a touch of salt and pepper. Place in a pre-heated 350 degree oven for about 20 minutes or until veggies are soft. Remove from oven and allow to cool down. Meanwhile, make the dressing. Place 3 tablespoons of the dressing into the bottom of a large serving bowl, and then add romaine and spinach and toss. 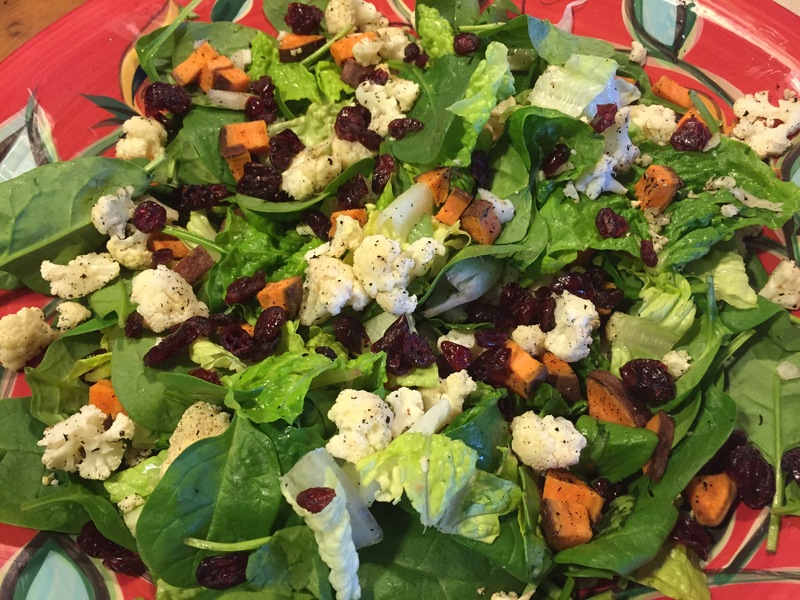 Place cooled veggies, celery and cranberries over greens and drizzle with another touch of dressing. Serves 6-8. Yes, I am still alive. It’s been awhile since I’ve posted. Thanksgiving, Christmas events, updating our youth room at church, and our active involvement in the local (and super spectacular!) production of The Nutcracker have kept me away from the keyboard except for quick check-ins here and there. However, these activities did not keep me from fueling our bodies with nutritious, clean foods. I made sure to have an assortment of fruits and veggies always on hand. And before it got crazy, my freezer was stocked with nutrient-packed snacks for school days. Today was our first Saturday together at home since September. After a “no-schedule” morning and afternoon,we grilled out and I made this salad with my leftover roasted butternut squash. Brussel sprouts and pumpkin seeds are both high in protein and butternut squash and swiss chard are great sources of vitamins A and C. AND swiss chard contains over 600% of your daily recommended intake of vitamin K (think bone support). Heat oil in a skillet over medium-high heat. Add onion and garlic and saute about 3-4 minutes. Add brussel sprouts and sear until tender and charred. Add in butternut squash and allow to brown. Season with a touch of salt and pepper. 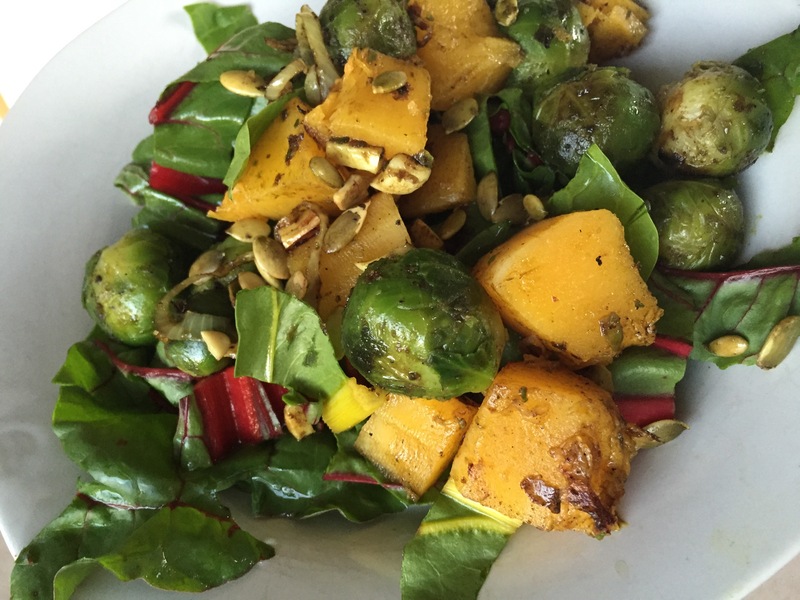 Place veggies over swiss chard and top with pumpkin seeds. Drizzle with a touch of balsamic vinegar. Serves 2.